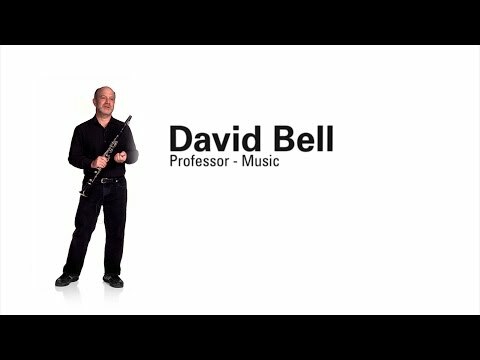 Clarinetist David Bell received his training at Oberlin Conservatory where he was a student of Lawrence McDonald and Northwestern University as a student of Robert Marcellus. Other teachers have included Larry Combs, Arnold Jacobs, and Clark Brody. He has performed with the Cleveland Orchestra, the Chicago Symphony, as well as the Milwaukee and Baltimore Symphonies. He has toured internationally with the Chicago Sinfonietta and the Solaris Wind Quintet. Prior to coming to Lawrence, Mr. Bell has held faculty positions at the Oberlin Conservatory, Baldwin-Wallace College, The University of Akron, West Virginia University, and Western Illinois University. Former students perform with ensembles such as the Los Angeles Philharmonic and the National Symphony, and others hold appointments at colleges and universities throughout the country. Mr. Bell has held Principal chairs with the Ohio Chamber Orchestra, Cleveland Opera, Cleveland Ballet Orchestra, and Akron Symphony Orchestra. He continues to be a frequent guest teacher and clinician nationwide. Mr. Bell is a member of the Peninsula Music Festival Orchestra, La Crosse Symphony, Fox Valley Symphony and the Swannanoa Chamber Music Festival. He appears frequently as a soloist and chamber musician throughout the Midwest.